The flank steak is a very lean cut of beef from the underbelly of the cow. Because it has long muscle fibers and little marbled fat, it requires proper cooking and slicing to bring out the tenderness. Flank steak is often used in tacos or fajitas, but when properly cooked, this flavorful meat stands alone in dishes such as London broil. Marinating adds flavor while tenderizing the meat. The acid ingredients in the marinade break down the connective tissue that is partly responsible for making the meat tough. 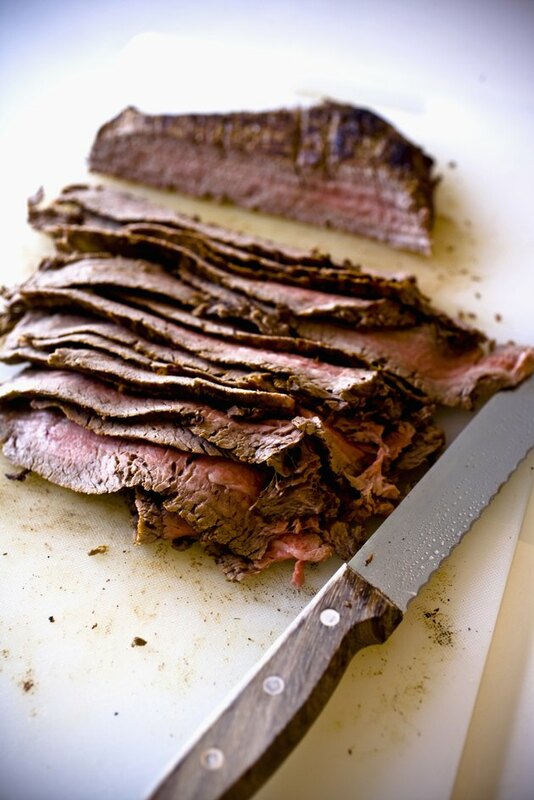 Marinate flank steak in the refrigerator for up to four hours. Longer marinating times risk denaturing the meat and ruining the texture of the steak. A traditional marinade for flank steak consists of two parts red wine and one part olive oil. Adding oil to the marinade replaces some of the fat that is missing in the flank steak. For an Asian flavor, try a marinade made from two parts citrus juice and one part soy sauce, spiced with garlic and ginger. Overcooking makes flank steak tougher and dries out the meat. Cook flank steak to medium-rare or medium doneness to prevent overcooking the meat. The U.S. Department of Agriculture recommends cooking flank steak to an internal temperature of 145 degrees Fahrenheit. Allow the steak to rest for at least 5 minutes before slicing. The temperature will rise up to 10 degrees F while resting. Grill flank steak over direct heat on a grill pre-heated to medium-high. Grill for approximately 5 minutes per side or until cooked to your preferred degree of doneness. Thick steaks may take a few minutes longer. Cooking quickly over high heat preserves the natural moisture of the meat. Place flank steak on a broiler pan under a pre-heated broiler. Broil for about 4 to 6 minutes, turn the meat with tongs and cook for another 4 to 6 minutes or until steak is done to your liking. Broiling utilizes high heat to quickly cook the steak, but expect a little smoke when using this method. Braising flank steak in a flavorful liquid like broth, wine or a tomato sauce cooks the meat slowly and brings out the tenderness. Brown the meat on both sides in a little oil in a hot skillet, and then add the liquid. Allow the meat to simmer slowly on the stovetop or in the oven for 1 1/2 hours or until the meat is done and tender. One of the most important techniques for a tender flank steak is proper slicing. After resting, slice the meat into thin strips, cutting across the fibers of the meat. You should see round bundles of meat fibers in each slice, not long chewy fibers.